Here you will find news articles, news releases and photographs of Barbara which were previously featured in the main news section. 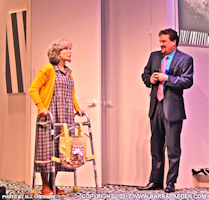 On October twenty-sixth Barbara appeared with Hal Linden in Love Letters at the Poway Center for the Arts. The two have toured extensively for sell out crowds. 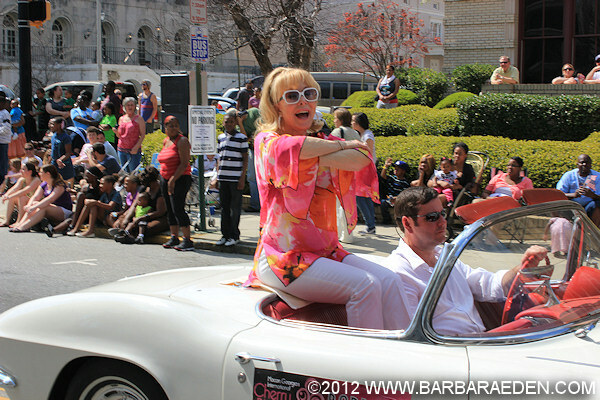 Barbara don's her famous harem costume and reprises her role as Jeannie! The theme of the 2013 Life Ball was '1001 Nights.' 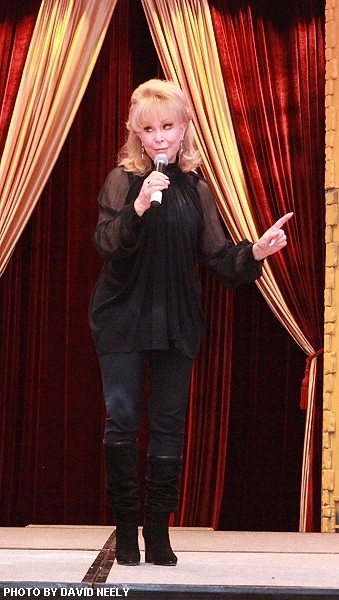 Barbara is seen here during her on-stage appearance where she danced, blinked and charmed thousands. Fans will note her belly-button (censored by NBC executives during the run of 'I Dream of Jeannie') is on full display in this nearly accurate replica costume. 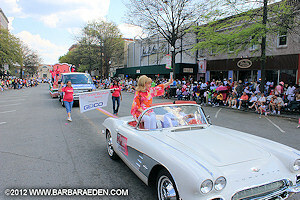 For more info on Life Ball visit their website. BE SURE TO CHECK OUT ALL THE GREAT PHOTOS FROM THIS EVENT IN BARBARA'S PERSONAL ALBUM! 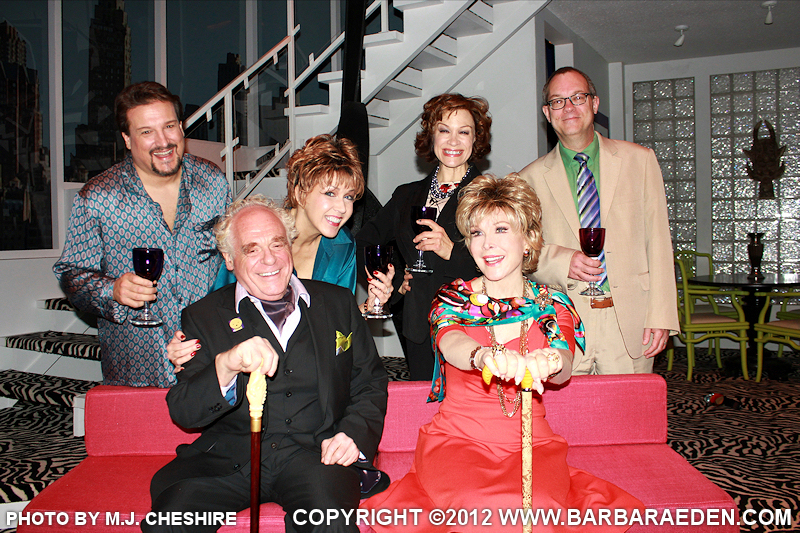 Barbara is seen here posing on set for an interview during her three month run at the New Theatre Restaurant in Kansas City Missouri in the hit comedy 'Social Security.' 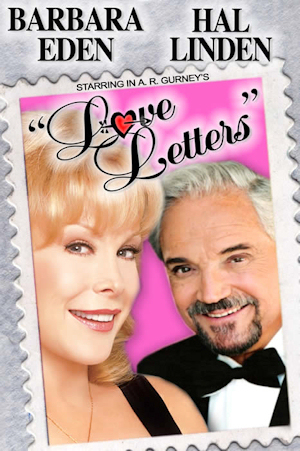 It focuses on trendy Manhattan art gallery owners Barbara and David Kahn, whose life is upended when her Mineola housewife sister Trudy deposits their eccentric mother Sophie (Barbara Eden) on the couple's doorstep while she and her husband Martin head to Buffalo to rescue their sexually precocious college student daughter. 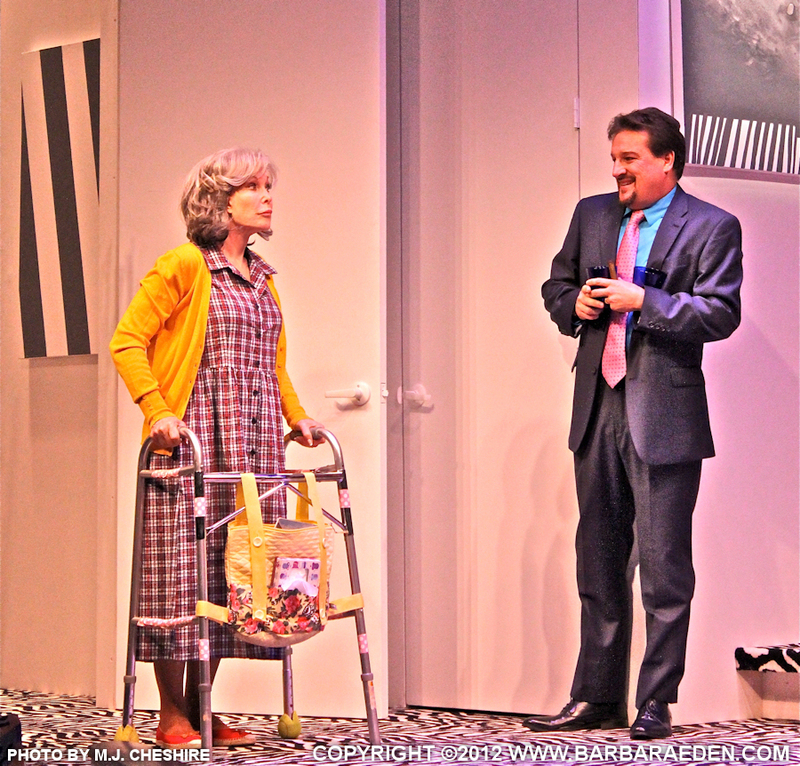 The two introduce Sophie to suave nonagenarian artist Maurice Koenig, who offers to paint her portrait and soon begins to brighten her life in ways she never expected in her twilight years! 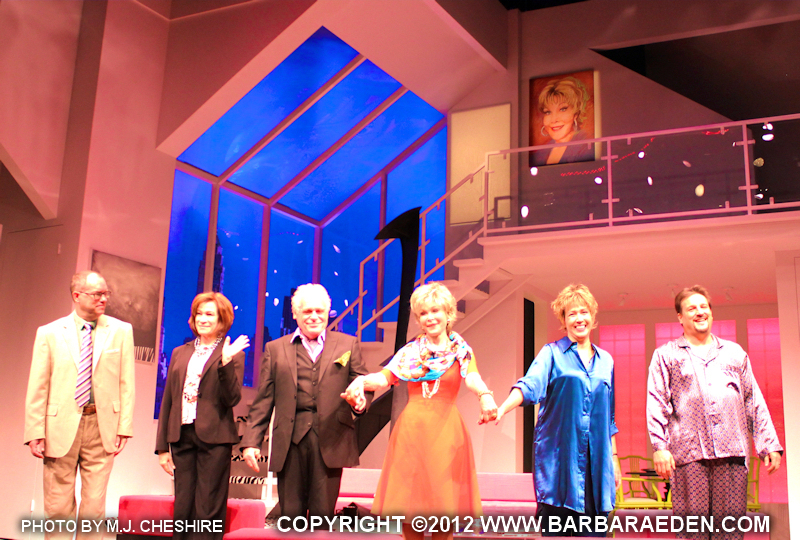 Check out some of the shots taken on the set during the show! 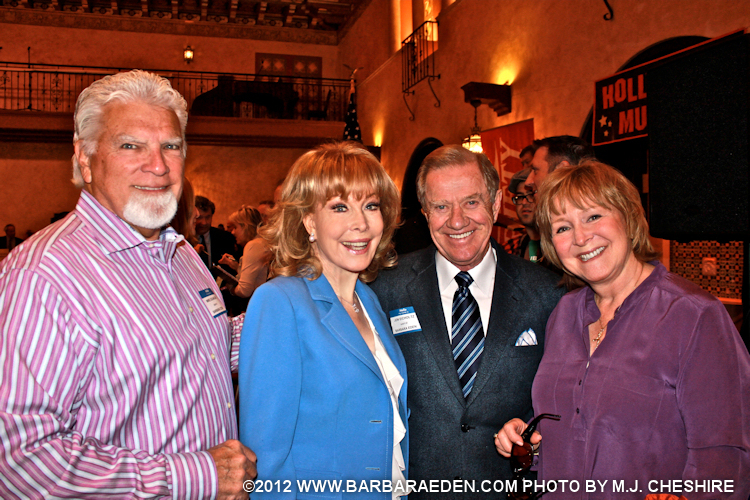 Barbara is seen here with President/CEO Hollywood Chamber of Commerce Leron Gubler, Christopher Barton and a chamber of commerce official. 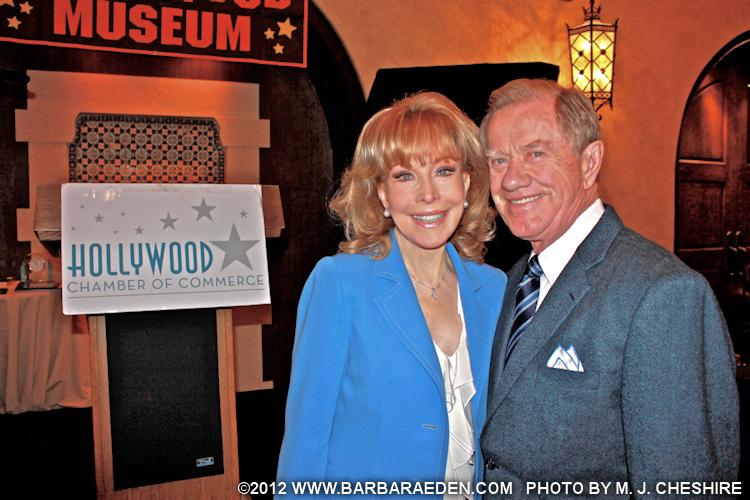 On April 26th Barbara was the recipient of the Hollywood Chamber Of Commerce's Lifetime Achievement Award. 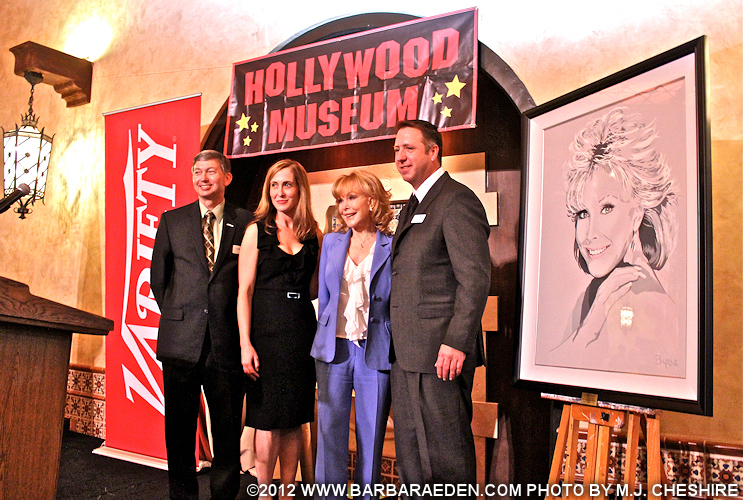 Barbara was presented with a large self portrait and was honored for her years of contributions to the Hollywood community and recognized for her many achievements. 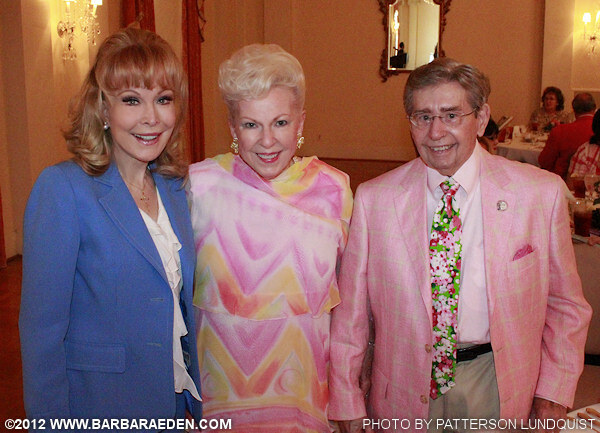 During the luncheon attendees were serenaded by a vocal group and watched the pilot episode of 'I Dream of Jeannie.' 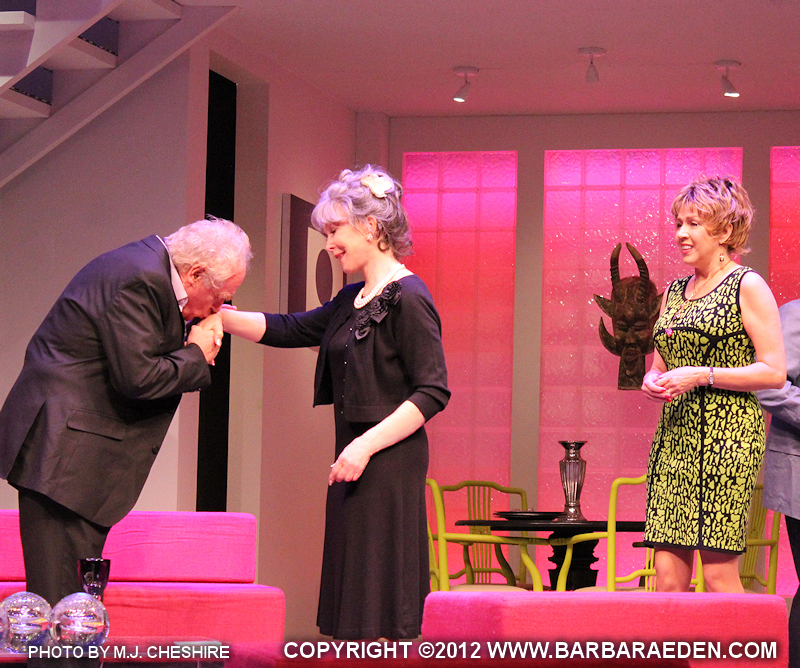 Click the photos below to view larger version! 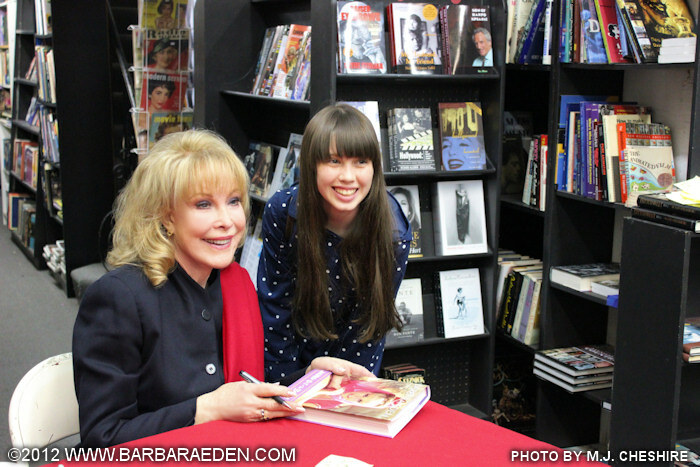 The evening of April 11th Barbara appeared at Larry Edmunds well known book shop on Hollywood Boulevard. Fans were able to sit and view the pilot episode of I Dream of Jeannie with Barbara. 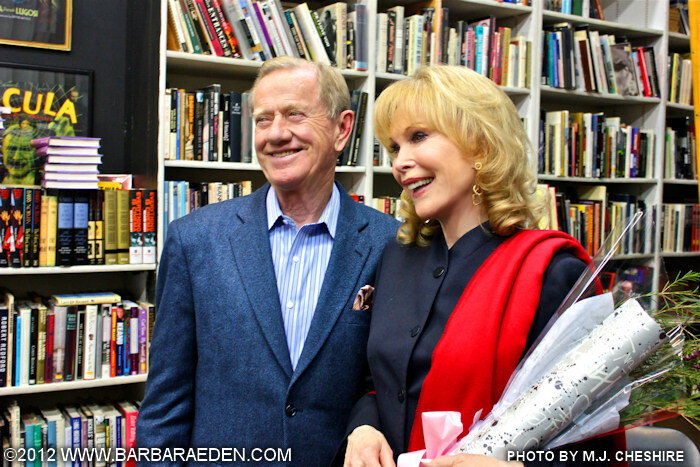 Afterwards Barbara answered questions and spoke about here years on Jeannie fondly recalling fun stories and sharing memories with fans in attendence. 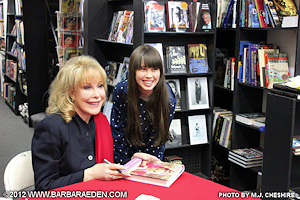 Following the screening Barbara signed copies of her New York Times Best Selling Memoir, Jeannie Out of the Bottle. 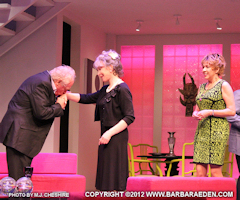 To view photographs from the evening click the photos below to enlarge them. Macon Georgia is known for it's annual Cherry Blossom Festival. For it's 30th year Barbara appeared as Grand Marshal in the Parade and spoke before a packed luncheon at The Idle Hour Country Club the following day. Barbara had never been to Macon before this and was thrilled with the festivities and the hospitality of Macon. "One of my favorite colors of course is pink, so it was a delight seeing it everywhere I looked," Barbara exclaimed. 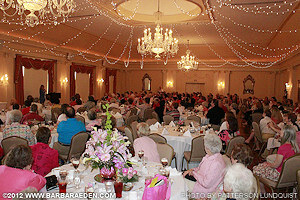 TO VIEW THE PHOTOS LARGE, CLICK ON THEM! Sometimes art travels beyond beauty or inspiration and brings the viewer to a place of stillness, of memory recall, and a longing for a time and place that is suffused with sweetness and nostalgia. The Drive In Daze paintings by Adam Scott Rote transports the viewer to long summer nights in spacious cars watching real movie stars in their signature roles. Today, we marvel at the 3D images jumping off the IMAX screen, but nothing replaces great storytelling. And here, Adam is telling the truly American story of those Drive In Daze, and the iconic stars who brought the films to life. 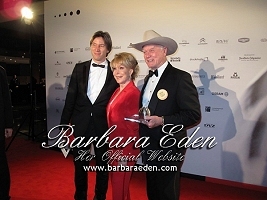 Barbara joined fellow 'I Dream of Jeannie' cast members Larry Hagman and Bill Daily at both the Sydney and Perth SupaNova Pop Culture Expo events this past June 2011. Coincidentally Barbara's dog Djinn Djinn is an Australian born Labradoodle who was flown from Australia to Barbara when he was only ten weeks old. Djinn Djiinn is now seven years old. Djinn Djinn was named after Jeannie's magical 'invisible' dog from 'I Dream of Jeannie.' Luckily he doesn't hate uniforms like his television show counterpart. 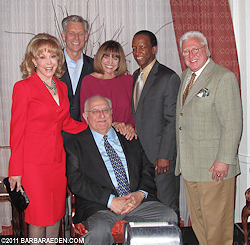 TO VIEW PHOTOGRAPHS FROM BARBARA'S TRIP CLICK HERE! 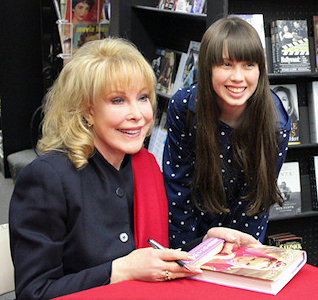 For five seasons in the 1960s, Barbara Eden starred as the titular heroine on the sitcom I Dream of Jeannie. Four decades and countless TV and film roles later, the Hollywood stalwart is still beloved for her magical, iconic role. With this month’s release of her memoir, Jeannie out of the Bottle (Crown). Jeannie Out of the Bottle... Down Under! Crown, a division of Random House announces that it had licensed Harper Collins the distribution rights for both Australia and New Zealand for Jeannie Out of the Bottle. Readers are treated to a unique snapshot of what it was like to have been there in the Golden Days of Hollywood seen through the eyes of iconic movie stars like Marilyn Monroe and Paul Newman. Plus fans of I Dream of Jeannie will enjoy Barbara's stories of the hectic, wild and crazy happenings on the sound stages of the classic television show. 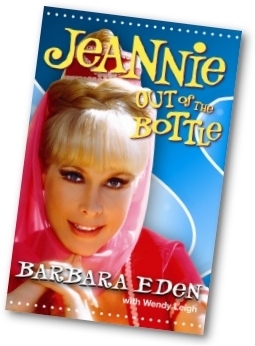 Jeannie Out of the Bottle is not only about the professional achievements Barbara has accomplished as a leading lady for more than four decades but also the laughter and tears of her personal life. 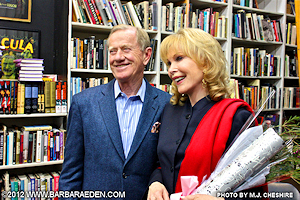 Barbara is seen here with Chuck Fries at his private book signing party on Saturday February 5th. 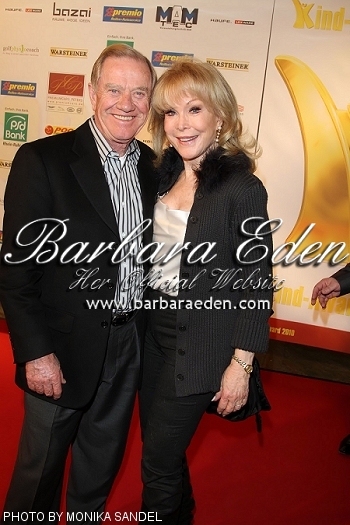 Among countless television movies Chuck produced the 1976 television movie "How To Break Up A Happy Divorce" which starred Barbara Eden and Hal Linden. Click the photo to the left to see it larger! Barbara recently spent a number of days in the Random House Audio - Books On Tape studio recording the audio book for her upcoming memoir! Click the photo to the left to see it larger! 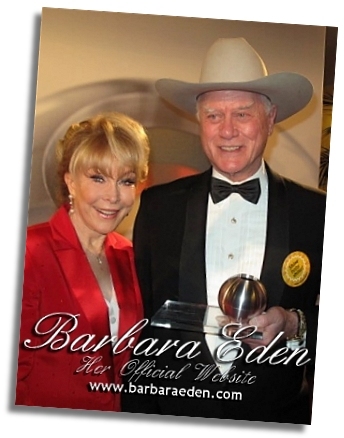 Barbara is happy to present to her fans the newest feature of Barbara Eden: Her Official Website, Barbara's Personal Photo Album. 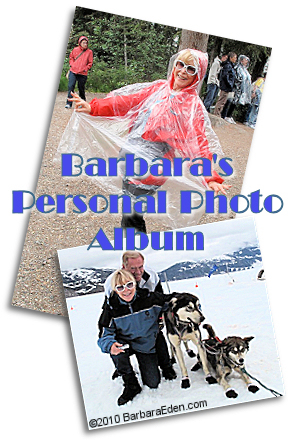 As well as rare and unpublished professional photography, this album also features never before seen photographs from Barbara's personal camera never before released to the public. 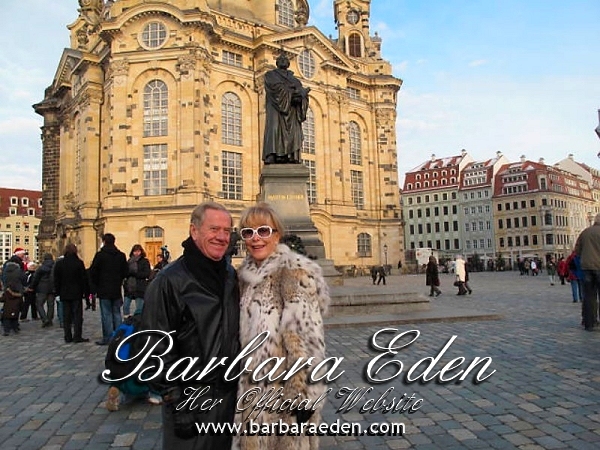 Now you may view photos from her travels and her personal life, hand picked by Barbara for you the fans to enjoy. 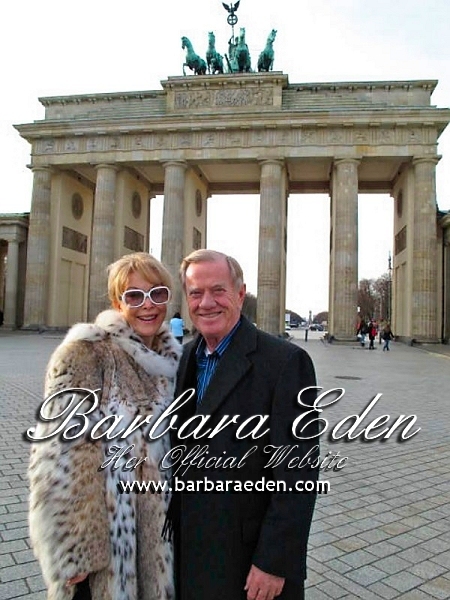 Stay tuned to the media section in the navigation bar for more photography from Barbara's personal life. During her trip to Germany Barbara and her husband Jon stopped off at a variety of famous landmarks in Germany. Most notably the Brandenburg Gate in Berlin and in Dresden Germany, seen below at the statue of Martin Luther. 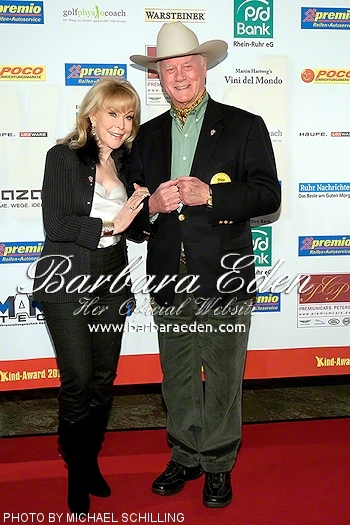 Barbara Eden and Larry Hagman Appear at the 2010 German Kinderlachen-Gala! 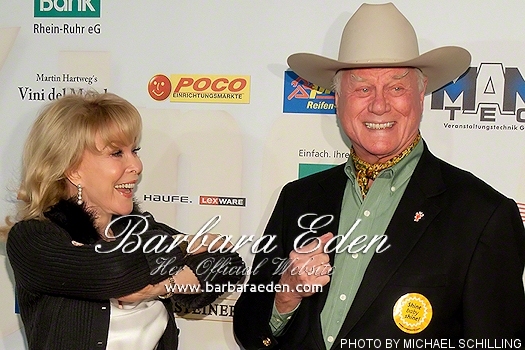 Barbara Eden and Larry Hagman attended the 2010 German Kinderlachen (Kinder) Gala (The Child Awards) in Dortmund Germany. Joining over 400 other guests Eden and Hagman graced the red carpet and were present for the Gala. Since 2002 Kinderlachen (Children's Laughter) has supported hospitals, children's hospices, day care centers, nursery schools and more, with donations and volunteer help. 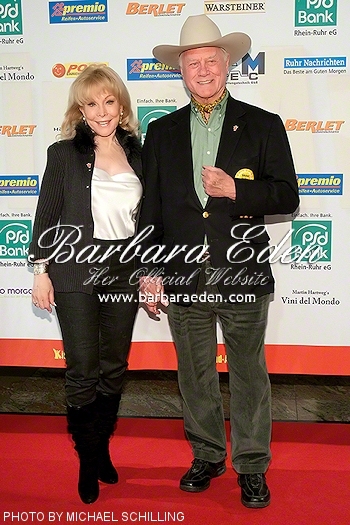 Barbara Eden Appears at the 2010 German Sustainability Awards! 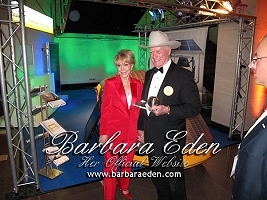 Barbara Eden made a surprise appearance at the 2010 German Sustainability Awards where her television 'Master' Larry Hagman was honored with an award. The Sustainability Award intends to encourage companies to operate sustainably and help to raise awareness of the principles of sustainable development. 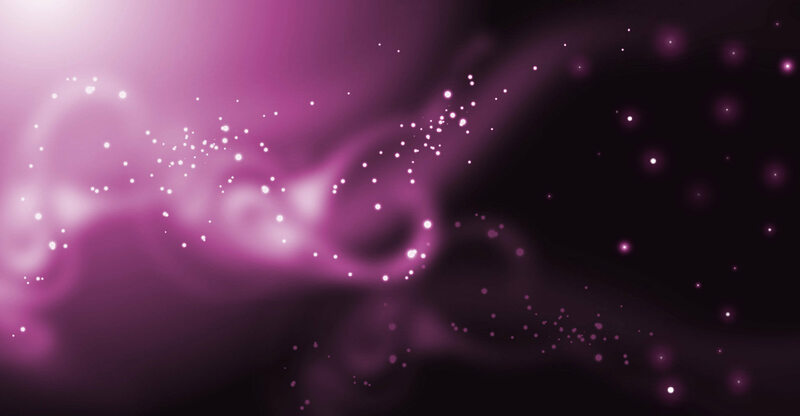 Awards are presented to companies that consistently and extensively implement the principles of sustainability throughout their business to a high standard. Previous laureates include HRH The Prince of Wales, the former Executive Director of the United Nations Environmental Program, Prof Klaus Toepfer, American actress and Jane Fonda and singers Annie Lennox and Yusuf Islam. Special awards are given to personalities who have made an extraordinary contribution to the cause of sustainability at a national or international level. Larry's tireless work and promotion of the Solar Power panel development company SolarWorld has been immeasurable. Thanks to Larry’s efforts, SolarWorld’s generous donation of 100KW of solar panels will power five more clinics in earthquake ravaged Haiti. 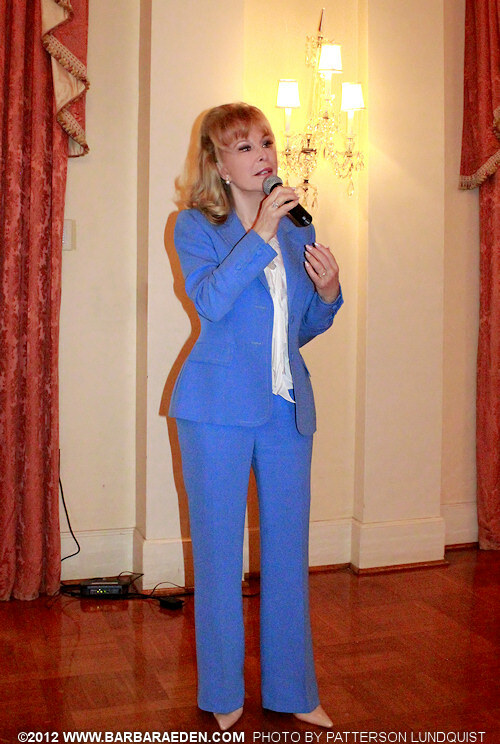 Barbara Eden appears at the Providence Speech and Hearing Center for the "Once Upon a Time" Benefit Gala! 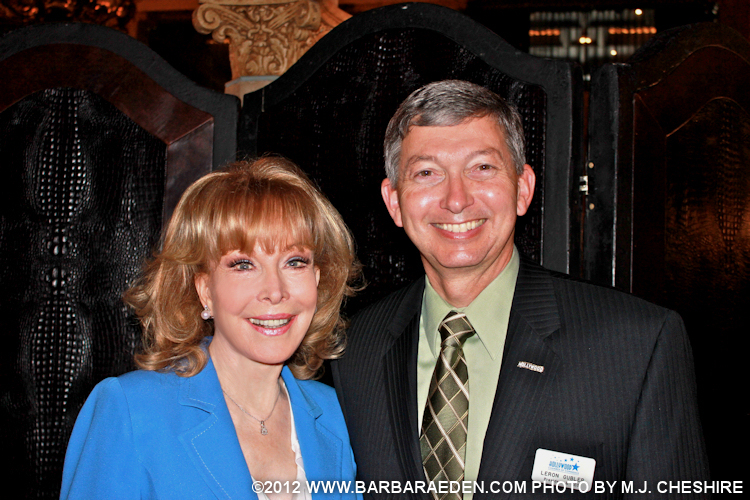 Barbara Eden appeared at the Providence Speech and Hearing Center 45th Annual Benefit. 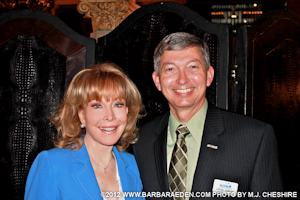 The 2010 theme "Once Upon a Time" invited guests to come dressed in fairy tale and fantasy costumes to help raise money for the Speech and Hearing Center which for forty five years has been the leading speech and hearing center in Orange County California. 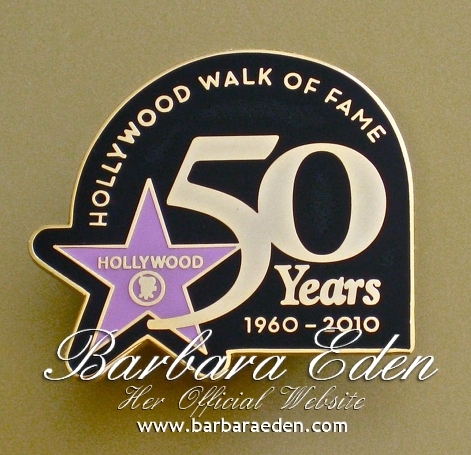 Barbara Celebrates the 50th Anniversary of the Hollywood Walk of Fame! 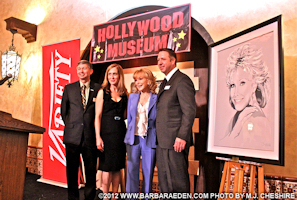 Barbara Eden joined countless other celebrities at the 50th Anniversary Celebration of the Hollywood Walk of Fame at the Kodak Theater on Hollywood Blvd. 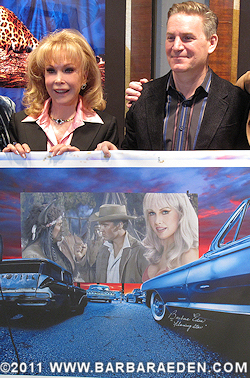 The event was catered by Wolfgang Puck with performances by Cirque du Soleil performers and Walk of Fame Honorees photographed by celebrity photographer Harry Langdon and presented with a commemorative pin and plaque of their Star. 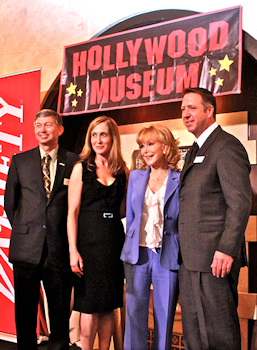 The event also saw a time capsule filled with various artifacts buried at the corner of Hollywood and Highland, to be opened fifty years from now (2060). 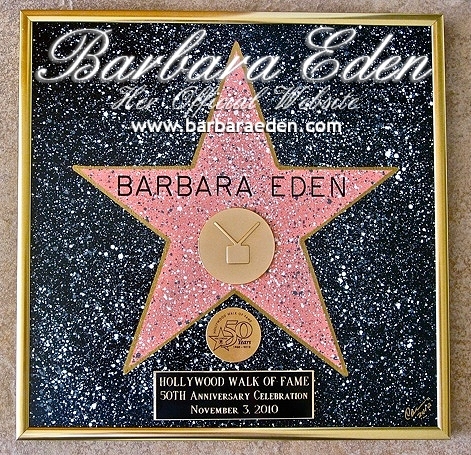 Barbara's star on the Walk of Fame can be found at: 7003 Hollywood Blvd. 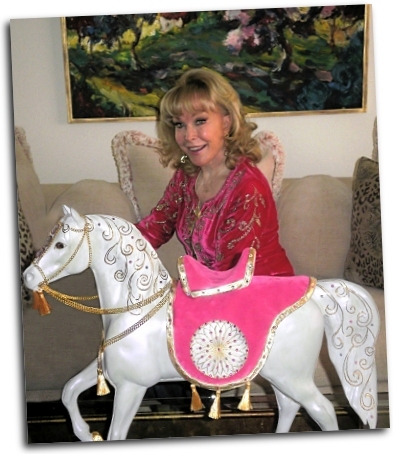 Award winning actress Barbara Eden has stepped into the spotlight as the newest star to be featured in the Celebrity Collection from The Trail of Painted Ponies. Ms. Eden has created an original Painted Pony reminiscent of her classic television show "I Dream of Jeannie" while artfully combining her passion for dreams and Native American dream catchers. This beautiful new Painted Pony is titled "Dreamcatcher" and is decorated with pink velvet, gold and crystals. "Creating 'Dreamcatcher' for The Trail of Painted Ponies is a dream come true," said Barbara. "I have always believed in the power of dreams, and it is such a pleasure to share the magic of dream catchers with my fans and collectors so that they may realize their own dreams." 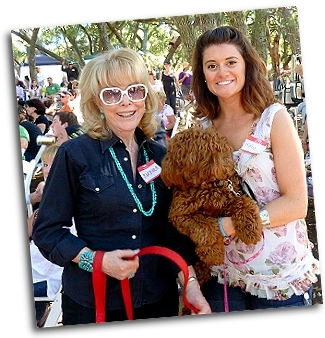 Barbara attended the 9th Annual Doodle Romp in the Santa Monica Mountains. The annual event benefited The Malibu Pet Companions (MPC). The MPC helps fund the Agoura Animal Shelter with funds for medical and foster care for homeless animals. 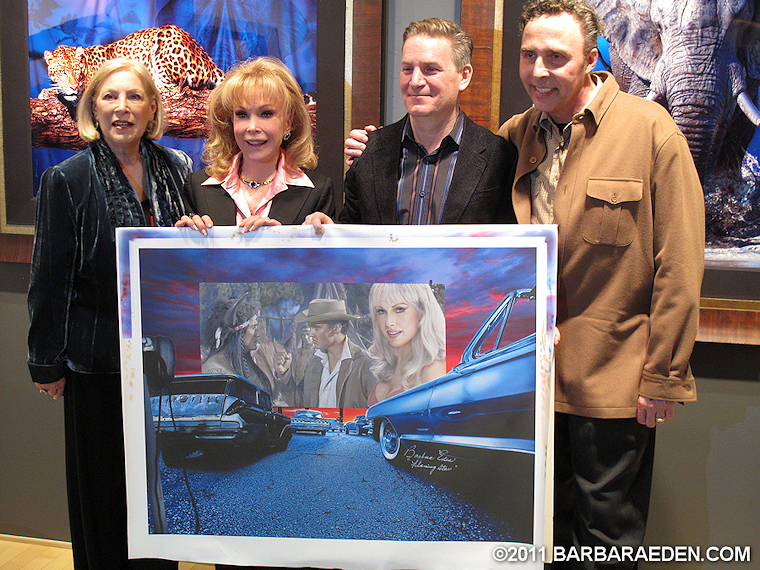 Barbara is seen here with Mollie and Ruby of Manor Lake Australian Labradoodles. 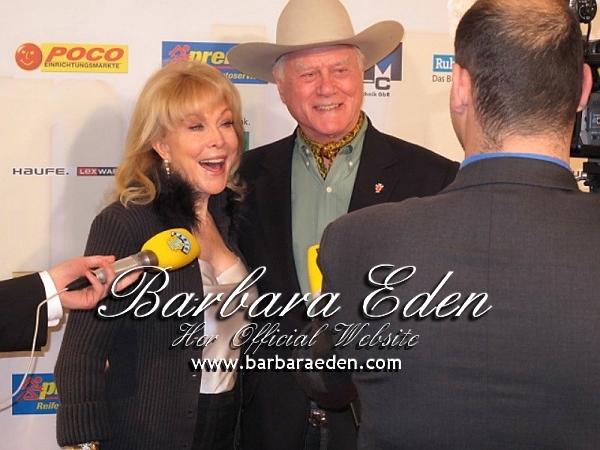 Barbara Eden, Larry Hagman and Bill Daily were reunited for the 45th Anniversary of I Dream of Jeannie at DragonCon, the largest Science Fiction/Fantasy Convention in the Southeast United States. 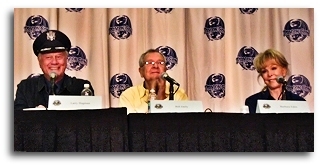 The three cast members spent three days appearing at various panels to discuss the show, its history and amazing following. 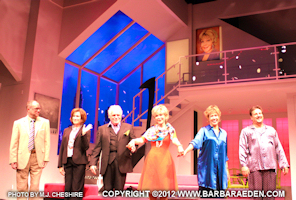 Included in the festivities, the cast was available for autographs as well as a special 45th Anniversary Photo Opportunity where fans could purchase an appointment to pose with Barbara, Larry and Bill with a backdrop of the interior of the bottle Barbara called home on the 1960's sitcom.